It’s been a rough couple months for Bayern Munich, who haven’t enjoyed the best start to their 2018-19 season. The Bavarians are third in the Bundesliga, four points off league leaders Borussia Dortmund — who they will face at the weekend. Though Bayern’s defense has been shaky at times, it has not been as big of an issue as their ineffective attack. The Bavarians have scored only 18 league goals this season, compared to BVB’s impressive 30. With Kingsley Coman injured, Die Roten have been forced to rely heavily upon aging duo Franck Ribery and Arjen Robben. Once world-beaters, the pair now find it difficult to overcome even the tamest of defenses. The Bavarian attack is clearly in need of rejuvenation, and the Bayern board has already hinted at their willingness to spend big in the upcoming transfer markets. The only question is who will they spend that money on? According to a report in L’Equipe, Bayern Munich are — along with Chelsea — heavily interested in Nabil Fekir. Previous front-runners for the Frenchman’s signature, Liverpool, are no longer considered a possible destination for the Lyon captain. 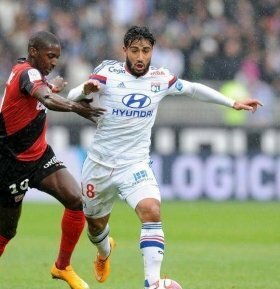 Fekir is a fantastic player, capable of playing as a striker or on the wing, but most comfortable in an attacking midfield role. He wouldn’t necessarily be a direct replacement for either Arjen Robben or Franck Ribery, but he’d provide another dimension to the Bayern attack, equally effective in its own right. His relationship with former Lyon teammate Corentin Tolisso could be a big selling point for the Frenchman. Together wing Kingsley Coman, Coco could help Fekir settle in at Bayern. There’s no denying Fekir is an exceptional talent, but he perhaps isn’t the best option for the Bavarians. His failed transfer to Liverpool over the summer definitely causes some concerns. The Reds reportedly backed out of the deal after noticing some warning signs in his medical diagnosis.